Amazing pants! They go so well with the blue shirt. What better than kick off the new week with vibrant floral prints? these pants are so awesome, you look gorgeous. If you get the chance check out my linkup today and share your amazing post. Love the chambray under the jean jacket! So cute!! Floral and denim are destined to be worn together - perfect look! Zara has been killing it lately! I love those pants! So pretty! Those shoes are amazing. Those pants are amazing and those shoes are a great match! love those pants! What a great way to add a pop of color! How fun are these pants!!! Love the bold floral pattern! 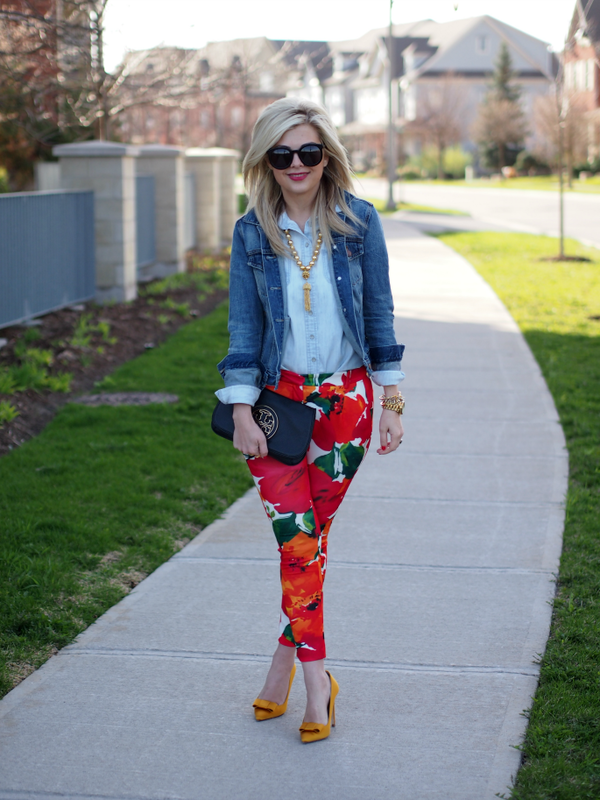 Great combination - denim jacket and florals! The colour of your shoes is amazing! I LOVE this! The floral pants are so fun, I love how vibrant they are, and those shoes are just perfect with them! And of course, a denim jacket is always a perfect topper for a printed pant! Love love! Oh my ghee, I love this outfit! I need to get my hands on those pants! Work it girl! loving those pants, great print! Love this look! The floral and the denim mixed are prefect together!